So, back in mid-December Courtney and I cruised down to Tahlequah, OK to hang out with Megan on her birthday. Ryan was in town too, and we hooked up with her, him, Emily, the other Ryan, Dana and that other girl and partied our asses off after having some yummy Thai food. Courtney also spent some time with her Mom and Dad, and I got to lose myself on teeny tiny roads through areas with names like “Punkin’ Holler”. Tahlequah is the town Courtney is from, and don’t you dare call it a reservation. It’s Native American alright, but not a reservation, damnit. Jokes aside, it’s a beautiful place and I want to see it in Spring. Then… it was Christmas. That was pretty cool. Then… it was New Years! Almost! Before New Years it was A Turning Point. You, the faithful reader, have known for some time how restless I am. I talk about wanderlust and my love of travel and how much I enjoyed my trip in Europe and so on. Well, something happened. Courtney was telling me about this book she picked up over lunch called “Vagabonding” that describes the art of leaving your life behind and hitting the road for long periods of time. I’ve wanted to do this for a long, long time and it turned out that Courtney accidentally left that book at my place one night. Friday, I believe. I should probably mention here that Courtney and I have been dating for a while, and that’s really cool. You already knew anyway, probably. Anyway, I read it on Saturday and by Saturday evening I had decided it was time to go. I’ve had some money saved up, and some more coming in from some side work and it all just seemed right. So, I’ve decided to take off for at least 6 months. I’m giving up my house, and my dog, and a lot of my things, and my job and I’m going to pack a small bag and see how much of the world I can see before I run out of money. Don’t worry, I promise I’ll write. My plans so far are pretty nebulous. I’m thinking I’ll start in Australia and then fly to Asia. My stated goal is that I want to set foot on all seven continents. Everyone keeps telling me I won’t be able to hit Antarctica which of course makes me want to do it even more. So yea, keep your eyes peeled for a going out of business sale at Jason’s house. AND THEN it was New Years! I threw a giant New Years Eve party at my house, as usual, and it was a great, great time. The theme was “Thrift Store Formal” which meant that you had to dress nice (suits, dresses and such) but only in what you could get at your local Salvation Army. 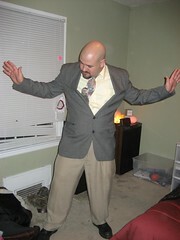 My suit, for instance, ran me right around $6. Ryan and Megan came up from Oklahoma and an incredible time was had by all. Or, at least, me. And… let’s see, at some point in there I saw Amon Amarth, and Namelessnumberheadman, and The Faint!, and The White Ghost Shivers and probably some other bands too. And I revived the balloon project! Did I already mention that? It’s coming along nicely. I have a renewed interest in electronics and I made my first ever PCB tonight. Maybe you should mention Courtney bought the book because it’s what Courtney wanted to do and you stole it and forbid Courtney from accompanying you. So now I have to go find something else fun to do to find myself, like a midget. If this is the only midlife crisis you’re gonna have, vagabond on, brotha. Then come back to your life and make babies and tell them stories about being broke for 6 months and loving every second of it.